WARNING! - you may NOT receive cream, even if ordered. Due to the natural fluctuations of milk production on grass, and due to the fluctuations in order volume, we cannot guarantee you cream. We always fulfill milk orders before cream, which means there may not be enough milk to make all the cream that is ordered. This is the reality. If needed, we may remove or reduce your cream order before processing your order, without contacting you. 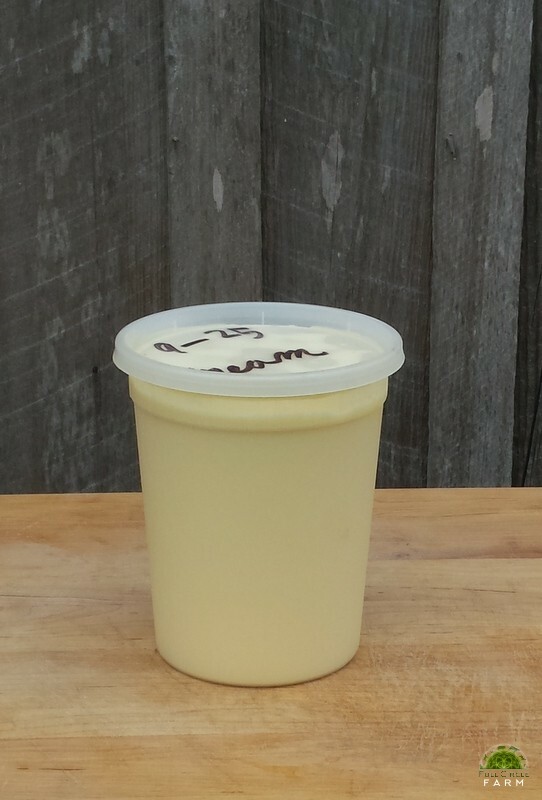 If you are open to receiving frozen cream in place of fresh or another product in the event that we are out of fresh cream, then tell us by leaving a note in the "Comments" field when submitting your order. Our cream is raw, thick and delicious. It takes between 2-3 gallons of milk to make 1 quart of cream. No wonder it's expensive! Click Here to view a recipe using Cream!